The Baroque old town of Passau at the confluence of the Danube, Inn, and Ilz Rivers on the German-Austrian border is worth exploring prior to departing on river cruises. Passau has a lovely location at the confluence of the Danube (Donau), Inn, and Ilz rivers on the German-Austrian border. Passau is the most popular departure port for cruises on the Danube River but the town has many interesting sights worth exploring too including a magnificent Baroque old town built on Gothic foundations, the largest church organ in the world, and spectacular views. 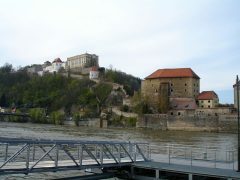 The favorable strategic position of Passau at the confluence of three rivers already attracted Celtic settlements 4,000 years ago. Written history started with the Romans and Passau’s strategic importance continued with the foundation by St Boniface of the Bishopric of Passau during the 8th century. 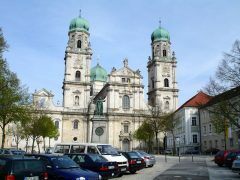 The Bishopric of Passau has the distinction of going from the largest in the German-speaking world during the Middle Ages to the smallest following the Napoleonic wars. 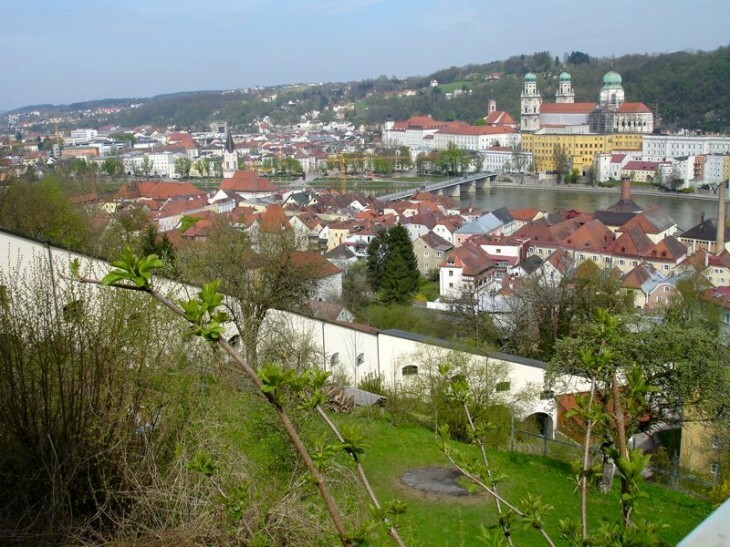 Throughout the centuries, Passau generally managed to escape serious war damage. However, most of the old town burnt down during a major town fire in 1662. As a result, most of the old town has a distinct Baroque appearance although the narrow alleys remind that this splendor was built on medieval Gothic foundations. 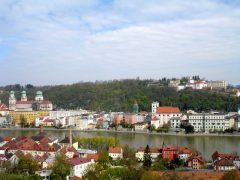 The old town of Passau is on the promontory known as the Donaustadt (Danube City) between the Danube and the Inn rivers. The train station, boat anchoring points, most hotels, shops, restaurants, and sights are here. The Passauer Dom Sankt Stephan (Passau Cathedral of St Stephan) at the center of the old town claims to be the largest Baroque church north of the Alps. The previous Gothic cathedral was damaged in the town fire of 1662 and only the exterior of the choir reminds of the former High Gothic church. The interior is overwhelming Baroque with gilded stuccowork, statues, and frescoes. Passengers on Danube river cruises to Vienna will notice the similar cathedral names – when the Stephansdom in Vienna was built, Vienna was still a mere outpost of the Bishopric of Passau. The world’s largest church organ is inside the Passau Cathedral – it has 17,974 pipes, 233 registers, and four carillons. Between May and October, the Passau organ is played on weekdays at noon for half-hour concerts – admission from 11:20 am – and longer concerts on Thursday evenings. The Passau Rathaus (Town Hall) is a mostly late fourteenth-century building on the banks of the Danube. The tower is from the nineteenth century and has the largest carillon in Bavaria. The Großer Rathaussaal (Large Town Hall), enter from the side street, has large wall and ceiling paintings depicting scenes from the Nibelungenlied – there is some (disputed) evidence that this epic poem was written for the local court. High-water flood levels are marked on the walls of the Rathaus facing the Danube. The Passauer Glasmuseum (Passau Glass Museum) is located inside the Hotel Wilder Mann. It has over 30,000 items of mostly Bohemian glass from the seventeenth to the mid-twentieth century. The Dreiflußeckspaziergang (Three Rivers’ Walk) is at the far end of the promontory. It is a short walk on the banks of the Danube and the Inn to the only point from where all three rivers can be seen simultaneously from the old town. The Inn is a much wider river at its confluence with the Danube and annually contributes slightly more water than the Danube. The Inn is much shallower (around 6 ft / 1.8 m) while the narrower Danube at this point is more than three times deeper. The water of the Inn is usually light green while the Danube is mostly muddy-brown (but occasionally actually looking blue) and the water of the much smaller Ilz a much darker, at times almost black. Boat trips to see the confluence and the mixing of the colored waters – the process take several miles – are very popular. The Ilzstadt is on the promontory between the Ilz and Danube rivers. The powerful bishops built a fortress here where they occasionally had to seek shelter from attack (mostly from the local population). 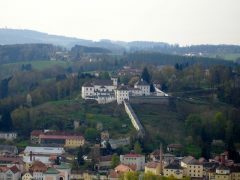 The Veste Oberhaus is on the hill and has spectacular views, an interesting museum, and the local Youth Hostel. This was the main part of the fortress and is linked by fortified passageway to the Veste Niederhaus (not open to the public) right at the confluence of the Ilz and Danube. It is a steep walk to the Veste Oberhaus but worth the effort for the views. In summer, buses run frequently up the hill from the Rathaus. The Innstadt is the sliver of Germany south of the Inn River – the unguarded Austrian border is very close. 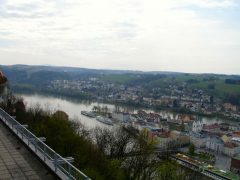 The hill gives some of the best views of Passau and the confluence of the three rivers. The Wallfahrtkirche Kloster Mariahilf (Pilgrim’s Church of Maria Helped Monastery) is the main sight here. The church was erected in 1627 but shot to fame after Emperor Leopold I prayed here in 1683 prior to the successful lifting of the Turkish siege of Vienna. The classical approach is along a covered Pilgrims’ Stairs walkway with 321 steps. Passau has many comfortable and reasonably priced hotels that provide pleasant accommodation for Danube cruise passengers who prefer to arrive the day prior to embarking on Danube riverboat trips. Despite being in the far southeastern edges of Germany, transportation to Passau is relatively fast and easy.